Need to move / install / replace broken switches, sockets or light fittings? Do you require lighting and power to your garage or outbuilding? Want your cooker / boiler / air conditioning / immersion heater electrically connected or upgraded? Plymouth Sparky is the answer! My aim is to bring a service to people who need the smaller electrical work done. PAT (Portable Appliance Test) available for your office or workshop electrical goods. We cater for small or large maintenance contracts or jobs if required. From a faulty light switch in the office or a blown light fitting, we are able to help and keep any disruption to a minimum, as not to affect you daily work routine. Plymouth Sparky looks forward to helping you! Electrical problems at home? Call us! 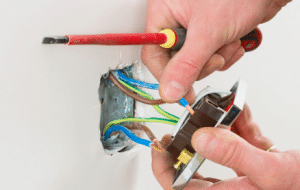 Whether you require additional sockets, lighting installation or consumer units replacing, Plymouth Sparky Electrical is dedicated to providing quality electrical installation, repair and maintenance services. Whatever electrical work you require for your home, a free quote is just a phone call away. From minor works to major electrical fittings, you can rely on us to help you. but also ensures peace of mind.